Each October, Ontario celebrates the hundreds of not-for-profit organizations across the province that help over a million people with disabilities and seniors live independently in their own homes and in the community. Throughout the month, there are different dates set aside to recognize those who provide different home and community support services - including attendant services, Meals on Wheels, Alzheimer and adult day programs, transportation to medical appointments, friendly visiting, caregiver support, hospice and palliative care services. Attendant Services Day is October 26th - it is the date for acknowledging all those involved in delivering attendant services in Ontario. PACE has delivered support services to adults with disabilities for over thirty seven years and, this year, our team will make a difference in the lives of over 320 individuals. Each member of the PACE team plays an important role in helping to ensure that each client consistently receives excellent and safe client experiences. While frontline team members have the opportunity to be difference-makers for clients every day – the members of the Administration Management team complete important work (like scheduling, payroll, recruitment, IT, etc.) that is essential for running the organization and ensuring that the frontline team members are able to be daily difference-makers. Through the daily contributions of all team members, PACE continues to be recognized by clients and partners as a leader, particularly with respect to delivering high quality client experiences. After completing a comprehensive input process with clients, staff and stakeholders, PACE has a new brand framework that includes refreshed mission, vision and values and a new logo and visual identity. In our new logo design, the corner of the “E” represents our individual and independent clients – while the rest of the word PACE represents the organization, providing support to our clients in the background. The new logo also includes our promise to clients: Live your life. “On behalf of the Board of Directors and Staff at PACE, we are proud to dedicate the naming of the PACE supportive housing program located in the PanAm site at 20 Palace Street to the “Joanne Wilson Program” to honour our former long-time Executive Director, Joanne Wilson”, said Bill Noble, Board Chair. PACE opened the doors on this supportive housing program to clients over a year ago - in May 2016. This was very significant as the units in this building were the first new units that PACE had opened in over 20-years! The Palace Street building was part of the Pan Am/Para Pan Am athletes’ village in 2015. It is owned and managed by housing and community service organization - Fred Victor. The goals for this building are to provide permanent housing especially for single adults, youth and families with high needs for affordable housing and on-site support services. In planning for this building, PACE led discussions with the architect to ensure that the designs for the units met the requirements for accessible housing. Today in 10 accessible units - PACE supports adults with disabilities by providing 24- hour, 7-day a week attendant services. PACE provides support services to 12 clients enabling them to live independently. In December 2016 after more than twenty-five years of dedicated and passionate service to PACE, Joanne Wilson retired as our Executive Director. Joanne began her PACE career as Executive Director in November 1990. At that time, there were three supportive housing projects and a budget of just under $3.0M. Through Joanne’s leadership, PACE grew to the current nine supportive housing projects, a large attendant outreach program and a budget of almost $15M. Joanne built and maintained significant relationships within the attendant services community and the health care system as a whole. In addition, Joanne became a well-respected member of multiple working groups and committees at the community, LHIN and provincial tables. Hundreds of not-for-profit organizations across Ontario, like PACE, have been supporting people with disabilities and seniors all year – this month, we’re looking to increase awareness of the important services we provide. October is Community Support month, an opportunity to celebrate the home and community care services which help over a million Ontarians live independently in their own homes each year. In addition to Attendant Services (Supportive housing and Attendant Outreach), there are over 25 different community support services, including Meals on Wheels, Alzheimer and adult day programs, transportation to medical appointments, friendly visiting, caregiver support, hospice and palliative care services, and much more. The service delivery model is successful because clients prefer to live in their own homes and communities, and supporting them to do so reduces costs to other parts of the health care system. Agencies that provide these services receive government funding, and many are also supported by community foundations, individual donations and thousands of dedicated volunteers. As Ontario’s population ages, community support services will become even more important. Community Support Service organizations are charities and not-for-profits governed by volunteer Boards of Directors and accountable to the communities they serve. Not-for-profit community support agencies go “beyond the basics” and serve as community hubs, where clients are able to connect to a number of care and social services in one convenient location. In Toronto, PACE Independent Living has been serving the community for over thirty five years in delivering support services to adults with disabilities who chose to live independent lives. PACE serves more than 325 individuals who have a variety of disabilities including multiple sclerosis, cerebral palsy, spinal cord injuries, acquired brain injuries, muscular dystrophy and Huntington disease. A big thank you to all of our staff at PACE during this time of celebration for the incredible work that each of you do every day to deliver excellent support services to people with disabilities so they can live their lives. For more information contact: Judy Ilcio, Director, Communications at 416.789.7806 ext. 231 or jilcio@pace-il.ca. June 2017 – PACE has been accredited with Exemplary Standing by Accreditation Canada which marks a very successful end to extensive process of organizational preparation and review. The survey took place May 29 - 31, 2017 and determined that PACE met all of the standards and criteria for an overall score of 97.3 per cent. Accreditation Canada provides four different possible rating levels; its highest recognition being Accreditation with Exemplary Standing. Exemplary Standing is for an organization that goes beyond the requirements and demonstrates excellence in quality improvement. PACE is proud to be a gold sponsor of the Breaking the Ice Conference - October 28 and 29, 2017. PACE will be providing the attendant services at this year’s event. What is Breaking the Ice? Breaking the ICE is a client-focused conference for people who use Augmentative and Alternative Communication (AAC). The purpose of the conference is to provide individuals who use AAC an opportunity to learn from each other, create meaningful relationships in the community, and have a platform to share ideas and feelings. The conference engages participants who are underserved in the community, with the goal of promoting Independence, Community inclusion, and Empowerment (ICE). How do I find out more and/or to register? It was announced today by Bill Noble, Chair, Board of Directors that after a comprehensive search, Laura Visser has been hired as the new Executive Director at PACE Independent Living. She will start on Monday December 12, 2016. Laura brings a wealth of experience and passion in leading change management initiatives, strategic planning, communication strategies and service excellence. She has extensive work experience in the community, hospital and government sectors. Her career began at the Ontario Community Support Association (OCSA) as the Member Networking Coordinator and Assistant to the Executive Director. Laura continued in leadership roles as her career path took her to the Michael Garron Hospital (formerly the Toronto East General Hospital) as Director, Communications, Planning and Partnerships and progressed further at Lakeridge Health as Senior Director, Corporate Strategy & Communications and then at Toronto Central Community Care Access Centre (TC CCAC) where she was the primary Lead on Strategic Sector Initiatives and Integrated Family-Centred Care for Children with Health Complexity. Laura’s accomplishments include inspiring, influencing and facilitating cross-sectoral dialogue – with the meaningful engagement of clients and caregivers – at the local, regional and provincial levels. Under her leadership, she delivered the “Complex Care for Kids Ontario” strategy which was approved and funded by the Ministry of Health and Long Term Care. Laura graduated from the University of Guelph with an Honours Bachelor of Applied Science degree in Gerontology and she also has a Masters in Health Science, Health Policy, Management and Evaluation from University of Toronto. Laura is a Certified Health Executive with the Canadian College of Health Service Executives. Laura is no stranger to PACE as she was a member of the PACE Board of Directors for over eight years (2004 – 2012) and the Board Chair for five of those years. During this time, I had the pleasure of working with Laura and I am very excited about working with her again and in her new capacity as Executive Director. PACE has been recognized by the Aphasia Institute as a Community Partner for its ongoing commitment and contributions to Aphasia community. Tracy Howell, Director, Support Services, who leads this effort, attended the Aphasia Institute annual general meeting where she received the honour on behalf of PACE. “Through this long standing partnership, clients benefit as PACE provides personal support to those who need it while attending the community programs at the Aphasia Institute” explains Tracy. “In return, the Aphasia Institute provides training for PACE staff on how to work with clients with aphasia and to help overcome communication barriers”. Aphasia is an acquired disorder caused by an injury to the brain and affects a person’s ability to communicate. It is most often the result of stroke or head injury. An individual with aphasia may experience difficulty expressing themselves when speaking, difficulty understanding the speech of others, and difficulty reading and writing. Sadly, aphasia can mask a person’s intelligence and ability to communicate feelings, thoughts and emotions. It was announced today by Bill Noble, Board Chair of the PACE Board of Directors, that a search has been launched for a new Executive Director. The new Executive Director will replace Joanne Wilson who will retire from PACE on December 31, 2016. After more than 25 years of dedicated, passionate service to PACE, Joanne is setting her sights on a well-deserved retirement and spending more time travelling and with family and friends. “I have had the pleasure of working with Joanne for more than five years and I am going to miss her tremendously and I know that many of you will as well.” said Bill Noble, Board Chair of PACE’s Board of Directors.Joanne began her PACE career as Executive Director in November 1990. At that time, there were three supportive housing projects and a budget of just under $3.0M. Through Joanne’s leadership, PACE has grown to the current nine supportive housing projects, a large attendant outreach program and a budget of over $14M. Joanne has built and maintained significant relationships within the attendant services community and the health care system as a whole. In addition, Joanne is a well-respected member of multiple working groups and committees at community, LHIN and provincial tables. Today (May 19) is Personal Support Worker Day! This day has been declared as it is an opportunity to recognize the valuable work of Personal Support Workers (PSWs) in Ontario. At PACE, approximately 80% of our employees have a PSW qualification. New PACE accessible supportive housing will be opening in May 2016 in what was the Pan Am/Para Pan Am athletes’ village. These are the first new supportive housing units that PACE has opened in 20-years! The building is owned and managed by social service charitable organization - Fred Victor. The goal for the building is to provide permanent housing especially for single adults, youth and families with high needs for affordable housing and on-site support services. The building, located at 20 Prince Street in the West Don Lands (known as the Canary District), contains 108 units and meets LEED Gold standards for building design, construction, operation and maintenance of green developments. PACE has made commitments for the entire PACE available units and the prospective tenants are anxiously waiting to move in. Participants from our acquired brain injury (ABI) art day program at the Paula Cassin Learning Centre are currently displaying their works at the Arts Etobicoke Storefront Gallery - 4893A Dundas Street West,Toronto, ON M9A 1B2. The exhibition runs until Saturday March 5, 2015. A group of PACE artists have named themselves the ABI (Acquired Brain Injury) Creative Connections - Raven Crow, Larry Eyres, Joseph Kure, Jorge Oliveira, Everado Quiel and George Szuszwalak - have created original pieces of art including paintings, sketches, photography and collages. These PACE artists describe the process of creating art as fun, humorous and an inspiring way to help their recovery. Every individual brings their own special gifts to the group and inspires creativity in each other. For more information about the art program and/or the display, please contact: Sherri Wheeler at 416.789.7806 ext. 312 or swheeler@pace-il.ca. We are pleased to announce that we have been asked by the Toronto Central LHIN to work with them on a service transfer that will have PACE taking over responsibility for Clarendon’s two supportive housing sites. This service transfer will result in the Clarendon Consumers receiving services from PACE and Clarendon Staff becoming part of the PACE organization. PACE will begin providing services on September 1st, 2015. In addition, we are delighted to share that we have a new Director, Support Services, Sallie Morrison, who will provide the senior leadership in overseeing these two supportive housing sites. Sallie has more than 20 year’s leadership experience in not-for-profit services for people with physical disabilities and for seniors in the province of Ontario. Most recently, she was the Director of Services including supportive housing for AbleLiving Services (Thrive Group). PACE looks forward to this new venture and to the continuation of a high level of quality support services to current and future Consumers at PACE. We will be working to ensure a smooth transition for all those impacted by the changes. PACE and the Brain Injury Society of Toronto (BIST) are proud to announce the creation of the Paula Cassin Education Fund. The Paula Cassin Education Fund provides funds towards educational opportunities that will enhance the lives of people living with the effects of an acquired brain injury. 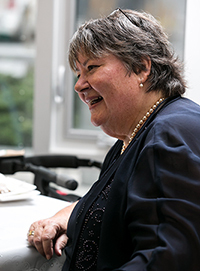 Paula Cassin’s career was spent being a tireless advocate for brain injury survivors. She made a significant contribution to the acquired brain injury community. Paula had a passion for lifelong learning. It is only fitting that this fund created in Paula’s honour gives back to the community she had such a significant impact on and in a way that she enjoyed. Paula was the Executive Director of abi Possibilities for the past eleven years, prior to Possibilities integrating into PACE in June 2014. She served on the BIST Board of Directors for three years and was the Board Chair in 2008/2009, her final year on the Board. The funds are intended to make available experiential learning opportunities to those who need them most. PACE IL entered into a partnership with Fred Victor Mission (as the lead) and Loft Community Services to bid on obtaining some of affordable, mixed-use residential units built originally for the Athletes' Village during Pan and Parapan Games 2015 in Toronto. PACE IL and its partners were the successful candidates along with Wigwamen Housing Inc., who is partnered with Ontario March of Dimes. For further information, read http://news.ontario.ca/mah/en/2012/10/pan-and-parapan-am-games-to-create-affordable-housing-legacy.html. PACE Independent Living has established an Accessibility Policy to ensure the full inclusion of persons with disabilities. The Accessibility for Ontarians with Disabilities Act, 2005 (AODA) provides a way for Ontario to become barrier-free. Accessible customer service came into effect starting January 1, 2012. The Accessibility Standard for Customer Service applies to all organizations (public, private and non-profit) that provide goods or services either directly to the public or to other organizations in Ontario and that have one or more employees in Ontario.